Eat the pies hot straight from the oven, when the filling still has a soft-flowing, custardy consistency or, if you can bear to wait, allow them to cool completely and serve at room temperature - the centre will have set to a delicate jelly. This recipe makes 12 muffin-sized pies, but you can also make 1 large pie, if you prefer (see Cook's tip). To make the pastry, place the flour and butter in a bowl. Using your fingertips, rub in the butter until it resembles fine breadcrumbs, then add the egg and lemon zest. Using a round-bladed knife to combine, add enough of the lemon juice for the mixture to form a ball. Wrap in clingfilm and chill in the fridge for at least 30 minutes. Preheat the oven to 200°C, gas mark 6. Place the pastry in the centre of a lightly floured work surface. Take a lightly floured rolling pin and roll out the pastry using short, sharp strokes, always rolling in one direction only. Give the pastry a quarter-turn, then roll it out again. Continue until the pastry is about as thick as a &poubd;1 coin. Using an 11cm straight-edged pastry cutter, cut out 12 discs. You may need to gather up the trimmings and re-roll the pastry. Line a deep 12-hole, non-stick muffin tin with the pastry discs then chill for 15-20 minutes. Prick the pastry bases with a fork. Line with baking parchment or muffin cases and fill with baking beans. Blind-bake in the preheated oven for 10 minutes, until the pastry is almost cooked. Remove the paper and beans and return the pastry to the oven for a further 5 minutes until it has turned slightly golden in colour. Remove the tin from the oven and allow the pastry to cool slightly. Reduce the temperature of the oven to 150°C, gas mark 2. Meanwhile, make the filling. Place the lemon zest and juice in a pan, add the sugar and 300ml cold water and heat gently, stirring until the sugar dissolves. Mix the cornflour to a smooth paste with 6 tablespoons cold water, then gradually stir into the pan with the lemon mixture. Increase the heat and bring to the boil, stirring continuously. Allow to boil for about 1 minute, until smooth, thick and glossy. Allow to cool slightly, then beat in the egg yolks one at a time. Spoon all the mixture into the pastry cases and level the surfaces. To make the topping, whisk the egg whites in a large, clean, dry mixing bowl until stiff peaks form, then gradually add the sugar and whisk until thick and glossy. 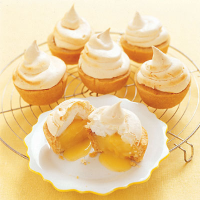 Use a piping nozzle to pipe the meringue mixture over the lemon filling. Alternatively, spoon the mixture over with a teaspoon, then, using a skewer or round-bladed knife, flick or swirl the surface of the meringue to give it some texture. Bake for 20-25 minutes until the meringue is crisp and golden. Serve hot or at room temperature. Alternatively, make 1 large pie. Grease a 171/2cm-diameter x 4cm-deep loose-based cake tin. Line with the pastry, gently easing it down the sides into the base. Leave any excess pastry hanging over the edge and set aside and chill for 15-20 minutes. Remove from the fridge and trim the excess pastry by rolling the rolling pin over the top. Blind-bake for 15 minutes, as in the main recipe. Remove the baking parchment then cook for a further 5-10 minutes. Once filled and topped with meringue, cook the pie for 30-35 minutes. Allow to cool slightly before serving, or the lemon centre will ooze out and make it impossible to divide into neat slices.